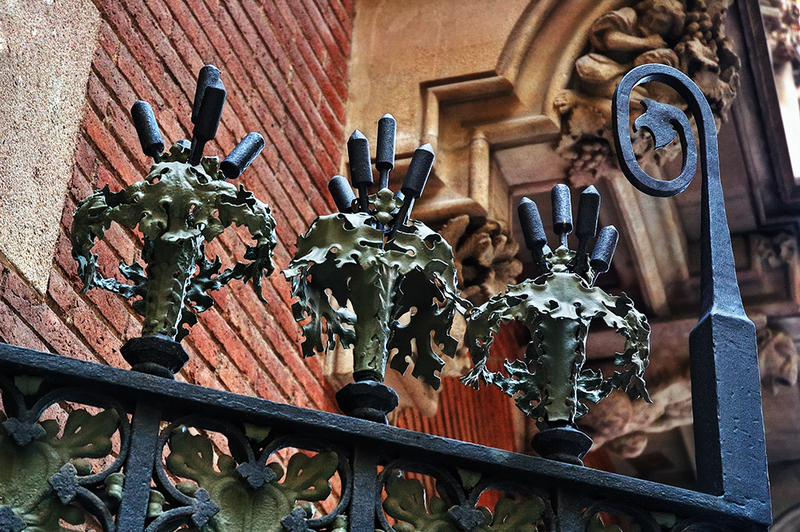 You wonder sometimes what Catalan Art Nouveau artists had in mind when they let go their imagination till their artwork almost reached the level of absurdity often sacrificing functionality for the sake of beauty. Take the case of the ironwork on this modernist gate. Obviously you could easily jump over the gate, I don't think anyone would get hurt with those "sharp" pod-like points but aren't they cute!. Check the history of Els Quatre Gats, to have a better idea of this must-see place located in one of those small streets you would probably not see on a quick visit. i am so impressed with the metal work in the city. charleston, south carolina also has alot of good metal work for the garden gates & fences. p.s. thank you for posting me on the sidebar! Hermes said this: Barcelona has the magnanimity of putting major sculptures on the avenues and Carrers. On Gran Via at the intersection with Passeig de Gracia, there is a beautiful reclining venus which I photographed. there are many such sculptures all around the Eixample.